One of the questions I’m asked on a regular basis from someone new to CrossFit, or someone considering CrossFit is, “how many times per week should I come?”. If you are new to CrossFit and your body is trying to adapt to the new movements you are learning, then 2-3 times per week is good for the first 3-4 weeks. After that, you need to be in the gym 4+ times per week, and here’s why. From a beginners standpoint, you are often very sore when starting CF and it takes a few weeks for your muscles to adapt to the new stresses. Coming consistently will aid greatly in your body adapting to the work. If you skip a week, your body has to basically start over. Also, there is a huge learning curve to CrossFit. There are (at minimum) 50 movements you will be learning and performing on a regular basis. While many of them will have the same foundational set up, the execution may be different, for example, if today’s workout calls for shoulder to overhead, that means you can use any overhead pressing movement you’ve learned to move the barbell in the overhead position. It is important for you to be familiar with all OH movements so you will be able to use the best method to complete the workout. If you’re not coming regularly, you will feel lost during a similar workout. Another reason to get to the gym more often is for adaptation. Adaptation refers to the process of the body getting accustomed to a particular exercise or training program through repeated exposure. 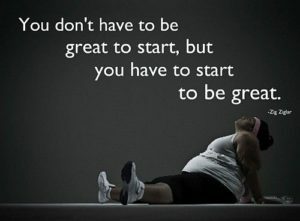 As the body adapts to the stress of the new exercise or training program, you become better at executing the movements. Now is when you will be able to increase your weights and intensity and you will really begin to see and feel the results of your work! Think of it this way. Compare working out to eating well. If you eat one or two healthy meals per week, you’ll feel pretty good for a few hours after each meal and you’ll feel good about your accomplishment, but it really isn’t going to make a difference to your body overall. The same is true with your workouts, one or two workouts per week might make you feel good for the day but it really isn’t going to make a big difference to your overall fitness. Now, having said that, if 2 workouts per week is all you can possibly fit in then that’s fine and certainly better than nothing! However, keep in mind that your progress will be slow and achieving the higher technical movements could be virtually impossible. Tuesday, CrossFit workout with skill work. Saturdays typically alternate between powerlifting workout and CrossFit workout depending on what I have planned with my husband/family for the day. This may seem like a lot but over the last few months, my body has adapted to this type of training schedule. I get 7+ hours of sleep/night, my nutrition is spot on and I rarely drink alcohol. All of these things play an important role in my body’s recovery process. For me, fitness is a lifestyle I have chosen and I will make all other things in my life fit around my lifestyle. In my experience, people who struggle with making it to the gym more than once a week have not yet chosen fitness as their lifestyle. They try to fit it in when it’s convenient and that never leads to longterm progress. My husband and I decided a long time ago that we would not be the parents or grandparents that sit on the sideline and watch the kids play. Case in point, this weekend we took our 9 year old grandson to Jumping World. If you’re not familiar with it, its a huge building with giant trampolines, located off of Sycamore View Rd. A ton of fun! We paid for an hour of jumping for the 4 of us, Steve, me, my gs, and his friend. Of the 150+ kids that were spread out throughout the trampoline park, there were probably only 2-4 other adults jumping with their kids. All others were sitting on the benches or couches on their phones. When I took a short break, I sat down on a bench beside a very obese man and overheard this conversation. The mans daughter (about 5 years old) approached and said, “daddy, I don’t have anyone to play with” to which he responded, “go make a friend”. My heart sank as she walked away. Missed opportunity. He honestly would have had a heart attack if he had started jumping. He, as many others, chose the easy way out. Get fat and do nothing about it. Make your fitness your lifestyle! Prioritize it and it will pay off for you now and in the long run!! Get better at CrossFit and watch your whole life get better! !